You might be surprised to learn that it is not necessarily the harsh cold temperatures that can negatively impact your asphalt surface. It is actually the freeze thaw cycle that happens continuously all winter long. When ice and snow begin to melt, it creates pooling water on asphalt surfaces, which can compromise the integrity of the surface. On top of that, as water freezes it expands. Expanding water in small potholes and cracks can increase pressure, creating cracks and can cause further damage to your asphalt surface. The use of hot-mix asphalt is important in colder climates because it is engineered specifically to withstand freezing and thawing cycles. Protect your asphalt investment from the winter weather with these helpful tips! To make sure your asphalt is in great shape once all of the snow melts, it is important that you set it up for a great start. This means, a thorough asphalt or street cleaning service. Consider getting your asphalt professionally cleaned for two key reasons. The first, to reveal any issues, like cracks or potholes, which should be repaired immediately. Secondly, to ensure that large pieces of debris don’t freeze and damage your asphalt surface over the course of the long, cold winter. Large debris can cause problems with snowplows and damage your asphalt surface. So cleaning your asphalt surface in advance will keep your asphalt looking great come spring. For a proper curing, seal coat needs a nightly temperature of at least 50 degrees. It is likely that in your area, sealcoating is no longer possible, but if your asphalt surface needs some pre-winter TLC, consider doing some crack filling to help prevent further damage to your surface over the winter. If you see pooling water now, you could see a pothole in the spring. Consider making repairs to compromised areas of your asphalt surface. Or schedule a spring service now with your local and reputable asphalt repair contractor to ensure your paving repair job can be fixed early, before the problem grows (literally) as the weather warms up. One of the key methods to protect your asphalt surface is to keep it free of standing water and snow over the winter months. The simplest method to do this is to shovel regularly. By taking the time to remove snow before it can melt and cause damage, you’ll keep your asphalt surface clear and prevent water damage. Using a plow to remove snow is very efficient, but be cautious, plows can snag in small cracks and potholes and cause surface damage to your asphalt pavement. 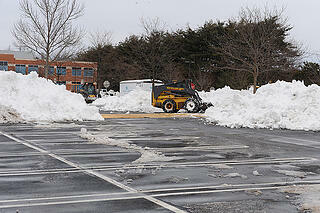 If you are looking to hire professional help for snow removal, make sure you do your homework. Consider a professional snow management team with experience in your area using commercial grade equipment. If you have a professionally installed asphalt driveway, you don’t have to worry about salt damaging your surface or causing potholes. But, there are environmental effects you should consider before your apply salt to your surface. Salt in water runoff affects plants and animals as well as local waterways. Did you know that studies have shown increased salinity in rivers, lakes and drinking water as a direct result of roadway salting? So while there are benefits to salt use, it is important to shovel and plow snow away first and use deicers sparingly. At Wolf Paving, we choose to use a mix of sand and salt because we find this is the best for melting, improving traction and having as little impact on the environment as possible. Pothole repair as the weather turns cold can be a tricky process if you are not a trained professional. It is, however, important to repair potholes in the winter to prevent them from spreading and causing further damage. At Wolf Paving, we are pothole paving experts. In fact, we have custom cold-mix asphalt designed specifically for Wisconsin winters and pothole repair. Take a look at our video on the cold mix asphalt process, from start to finish. At Wolf Paving, we own the materials and plants, which allows us to control the entire process and provide you with the highest quality custom asphalt mixes to meet your specific paving needs. Is your asphalt prepared for the cold winter weather? Follow our tips to protect your asphalt surface and save money from costly repairs in the long run. It’s not too early to request a quote and get on our list for spring projects! Call Wolf Paving today! For the Milwaukee area, call us at 262-965-2121. For the Madison area, call us at 608-249-7931.